The doctor was usually only called in an emergency, as he would have to be paid and many patients were too poor to afford him. For the more mundane problems of the time many people might get advice from the local nurse or chemist. In 1851 Mr Johnson Cripps was the chemist and druggist operating from the same place as the chemist's is today. Ten years later the business was the same, but the druggist is George Patman. He was also the postmaster, stationer and agent for Gilbey's wines and spirits. At the turn of the century he was no longer the postmaster, but had added bookselling to his trades. This Thomas Ellis was, at the time, a well-know entertainer and for many years provided public entertainment in the Town Hall. Dr Lawson Tait McClintock came to Loddon, aged 24 in 1902. 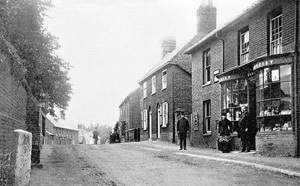 He lived in The Chestnuts, Beccles Road with his wife. He was appointed Medical Officer of Health for the Rural District Council (RDC) in 1910 on the resignation of Dr Prior. He held several other local appointments and had extensive private practice. At the outbreak of the Great War he organised the Red Cross Hospital for wounded and convalescent soldiers in the Lecture Hall attached to the Methodist Church on George Lane. Mrs McClintock was the commandant and ran the hospital on a day to day basis with a staff of voluntary nurses, orderlies and helpers. In 1915 tragedy struck the Blythe family who lived by Church Plan. As the death card shows, three members of the family, Phyllis, aged only 4 months, Humphrey, aged 5 years, and Herbert aged 4 years all died within a few days of each other. We have been told that they caught typhoid, probably from the village pump opposite their house, and having laid ill with fever for several days succumbed and were buried together in Loddon Churchyard.